Folding Hunting Knives or Hunting Pocket Knives are pocket knives with a blade locking in open position for safe and practical handling. 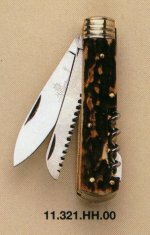 Around the year 1865 knife-manufacturers in Solingen started crafting folding hunting knives under industrial condition in large series. Such knives soon got an excellent reputation wordwide - due to their shape, their richness of detail and their handle slabs out of genuine stag horn. The backlock, positioned at the end of the handle, enables an uncomplicated unlocking of the blade in order to close it after using the knife. Additionally folding hunting knives are often provided with highly detailed components for different hunting tasks. 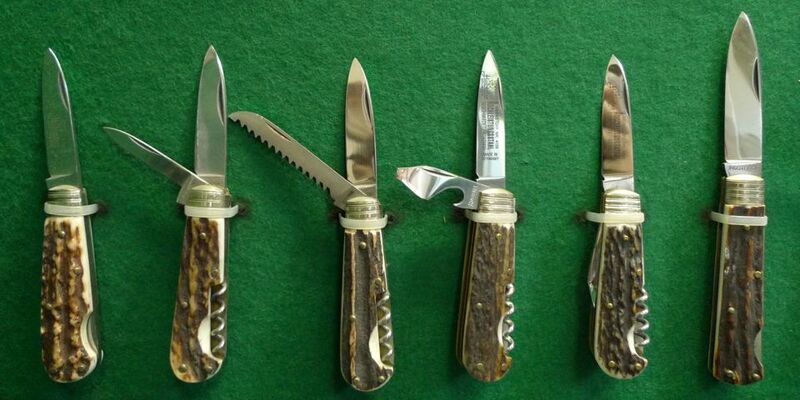 From the left to the right: Hubertus - Hunting Knife Series 10, 11, 12, 13 and 14. Our HUBERTUS backlock series „11“ with lockable blade (7 cm /2.76") is characterised by a classic backlock at the back of the handle to unlock the blade. The handy handle size of only about 9.5 cm / 3.74" enables together with the low weight of the knife a comfortable and permanent carrying of the knife in (pocket/ jacket) trousers. The overall size of the knife with opened blade amounts about 17 cm / 6.69". 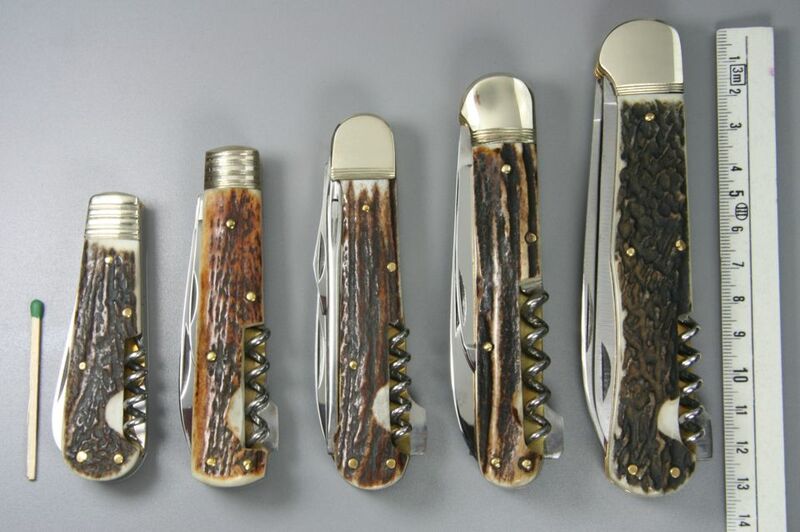 large size size pocket knives are usually stored in a belt pouch or a backpack. Our HUBERTUS backlock series „13“ with a handle length of 11.5 cm / 4-3/4" and an overall length of 20 cm / 8" open is manufactured in different varieties. The oversize HUBERTUS backlock series "14" fulfills the requirements of users who hunt big game, who have large hands or who just love extraordinary large knives! Length of the handle: 13.5 cm / 5.31" and total size with blade opened: 24 cm / 9.45". We offer matching brown leather belt-sheaths for both horizontal or vertical fixing (ref. # 19.040.LE.14). This series is manufactured with high performance stainless steel forged in a die or carbon steel as material of the blade. Our HUBERTUS backlock series "Countryline" offers a cost-efficient hunting knife for those users who won't abstain from the well-known quality and reliability of HUBERTUS products. This part is still under contruction and will be completed soon.